How many set's of blueprints do I need to build a house? Are these plans available mirror-reversed? Do you offer material lists? Why would I want 2x6 exterior walls? What about the new "styrofoam-block construction"? Are your plans available with basements? What is a "view-out" basement? What is a daylite window? What type of foundations are available with the plans? Can you make our changes for us and what does it cost? How much does it cost to build these houses? Q. How many set's of blueprints do I need to build a house? A. Sometimes only one by passing the same set around to sub-contractors but, If you want more than one contractor bidding at the same time then extra sets are handy. Some building departments may require a set and sometimes mortgage companies as well as home owner associations may require a set also. To meet industry standards, we offer a five (5) set package. Q. What is a PDF? A. PDF files are electronic versions of reproducible masters. The PDF can be emailed to suppliers, sub-contractors, engineers and financial institutions to save time and money on projects. They can also be emailed (or put on a flash drive) for local printers to get as many full size 18" x 24" (1/4" scale) copies as desired and even print small copies with a desktop printer. This format includes a Building License which allows modifications of the plan as well as unlimited construction. Q. Are these plans available mirror-reversed? A. Mirror reverse plans with "proper reading" are now available for $100. Q. Do you offer material lists? A. We don't at this time because different materials will be used depending on your location. Most lumber stores offer free material lists to get your business. They also use materials that are available in your area. They will need to borrow a set of your blueprints to work from. A. Our plans specify UBC (Uniform Building Code) and that the finished house meets all local codes as well. Different parts of the country require different materials because of snow-loads, wind shears, seismic, etc. So here again, we try to keep the plans as simple as possible for your contractors to do their job. Q. 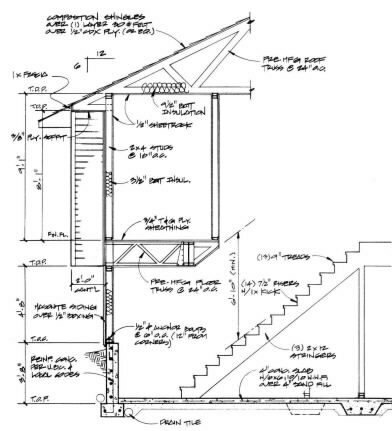 Are your plans designed for 2x4 or 2x6 exterior walls? A. We specify 2x4 walls however, the dimensioning method used allows the use of 2x6 walls without having to change many of the numbers if any at all. Q. Why would I want 2x6 exterior walls? A. The insulation value is R19 (R13 with 2x4 walls) which may save a few bucks on your utility bills. The problem is that it costs more to build so your house payment goes up as well. IRC code (International) requires 2x6 exterior walls. Many other cold weather areas are making this a requirement as well (check with your building department for requirements). Q. What about the new "styrofoam-block construction"? A. This method costs from 10% to 25% more to build at this time but has an R-Value of about 20. And since styrofoam is said to last a million years by environmentalists it makes good sense to build houses with it. As this method gets more and more popular, the costs are likely to drop as well. Q. Are your plans available with basements? A. Basement foundations are standard. Slab or Crawl-space foundation plans may be added to plan orders for an additional $125. Q. What is a "view-out" basement? A. This is where normally the property on the back of the house allows a drop in the foundation (Shown in the wall section above) to have larger windows downstairs. This can also be done on a fairly flat lot by raising the foundation and adding steps from the garage to the house. Q. What is a daylite window? A. Full basements that do not have view-out or walk-out capabilities (due to lot conditions) are provided with "window wells" that allow full size windows for natural light and fire escapes. Q. What type of foundations are available with the plans? A. Basement foundations are included with all houses. However, we dimension the foundations in such a way that they can still be used with slab or crawl spaces with very minor changes for your contractor, or slab and crawl-space foundation plans may be added to plan orders for an additional $125. Q. Can you make our changes for us and what does it cost? A. Yes we do modify plans here and the cost depends on the amount of changes. Basically, you need to purchase the PDF's or reproducible vellums plus $50 an hour for the extra work. Please call or email for an estimate, we can do a lot of work in an hour (for example, add a 3rd car garage or move 1 or sometimes 2 major exterior walls). Q. How much does it cost to build these houses? A. The actual cost of construction varies from one region to the next, the national average is about $95 per square foot. Basically a 1200 sq. ft. home would run about $114,000 to build and would include a 2-car attached garage and a full unfinished basement, but would not include land. Check with Builders in your area to get an even closer figure and then multiply it times the square footage of the home you are interested in.